Like so many congregations in recent years, Kol Ami has begun an effort to adapt their current facility to accommodate 21st century worship practices. PKSB entered a design competition to renovate the existing 280 seat sanctuary. 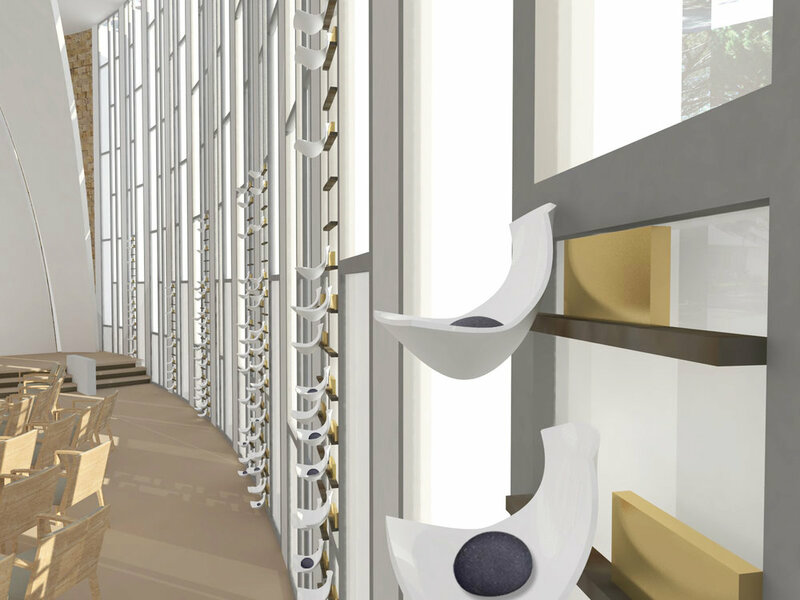 The goal of the design is to maximize and augment the architectural character of the original and to provide a sanctuary that is unique to Kol Ami. Inspired by the Miskan (Tabernacle) as described in Exodus, the proposed ceiling is a tent-like structure that floats freely in the double-height space. Its shape highlights the ark which is housed within its own shrine, a Kodesh Hakodashim (the Holy of Holies). To accommodate a diversity of services and varying numbers of participants, flexible seating and a movable reading table is proposed. A new window design emphasizes the verticality of the space and allows for the incorporation of existing stained glass elements and yahrzeit memorial plaques.